Sebastian Kienle on the bike portion of the 2014 GoPro Ironman World Championship in Kailua-Kona, HI on October 11, 2014. 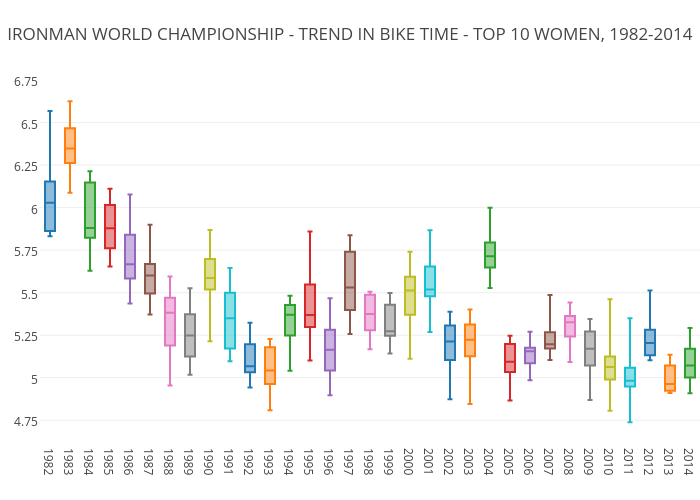 We continue our analysis of trends in racing at the Ironman World Championships with a detailed look at historical performance on the bike. Again, for those just getting into the series you’ll find an explanation of the graphics in our first installment (it’s right under the first chart). If you’re less interested in the details, here’s a quick key provided by faithful Starkolyte “Theo”.And now, without further ado, a colorful picture to show that data really is beautiful. We can immediately see that, unlike the swim, the bike is an extremely dynamic element of the race. Performances have become markedly faster over time. Even with conditions causing a noticeable group of “slow years” between 1997-2004, there is still a noticeable tendency toward faster times on the bike. This is especially true of race winners. Another immediately noticeable trend is that the bike is where the field spreads out every year. Unlike the swim, where the top ten finishers consistently arrive in transition within three minutes of each other, the bike field typically dilates to a 15-20 minute gap between first and tenth place. As “commenters” in the associated forum on this series have already mentioned, there is a lot of room in this field for cycling specialists to outpace the men who ultimately take home prize money. However, our objective here is to compare the ten best triathletes from year to year. Considering the absolute ten-fastest bike splits from year to year would skew our results in that pursuit. The men’s champion has had the fastest bike split in four out of the last ten races. The slowest bike split rank a champion posted was seventh. Craig Alexander did it twice, in 2008 and 2009. The average time difference between the overall winner and the tenth place finisher is 18 minutes and 14 seconds. The average difference between the fastest and slowest bike split is 17 minutes and 4 seconds. 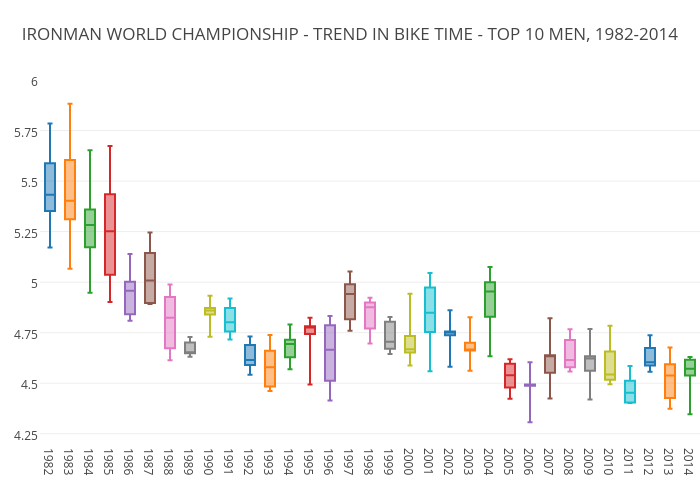 Of further note, the gap between the first and tenth place male has only been less than the gap between the fastest and slowest bike split four times in the last ten years. While there are still shifts in who gets what specific place in the field (as Crowie showed us), the field itself tends to widen out after the bike. Before we delve further into what these numbers mean, let’s see how the women’s field looks in comparison. Again, let’s throw the obvious stuff out first. The women’s field strongly correlates to the men’s field on a year-to-year basis. From this we can reasonably deduce that wind conditions on the Big Island have a significant effect on bike performance during the race (hey, this is the obvious part). Cross-referencing the fastest (2009, 2010, 2011) and slowest (2004, 2008, 2012) years in recent memory for the overall groups with historical weather data indicates that the pack will remain closer together and go faster when the winds stay below 15 mph. When the winds kick up much higher than that, the field slows down and spreads out, indicating that better cyclists get farther ahead under worse conditions. It’s less obvious to tell if the women are getting overall faster. Chrissie Wellington’s run in Kona was all about blowing the curve. It seems there is a trend toward faster times, with weather conditions slowing things down a bit over the last three years. And how do their other trivia facts compare to the men? The women’s champion has had the fastest bike split in four of the last ten races. The slowest bike split a women’s champion posted was seventh. That was Mirinda Carfrae in 2013. (Technically she had the 8th fastest split, but Yvonne van Vlerken DNF’d on the run later in the race). The average time difference between the overall women’s champion and tenth place is 29 minutes and 54 seconds. The average spread between the fastest and slowest women’s bike splits is 25 minutes and 12 seconds. The final spread in the women’s race has never been less than the bike field. The fact that the women’s field behaves so similarly to the men’s field allows us to draw some conclusions from history, and thereby make some predictions about the future. First, if you’re out to win the Ironman World Championships (or pick the winner in your fantasy triathlon game) you need to finish at the front of the bike field. That Alexander and Carfrae won from a 7th best bike split only serves as further testimony to their running prowess (which we’ll cover in the future). For those competitors with a more rounded skill set, your odds of winning start dropping fast if you’re farther back than third coming into T2. If you’re in 8th, 9th, or 10th, forget about it. By the time the pros hit the marathon, it’s a 4-person race for the podium. The Olympics this ain’t. This analysis admittedly occurs in somewhat of a vacuum. We will also examine run statistics on their own before delving into how the combination of those two disciplines influence the overall race. Before that, there are some questions that deserve further exploration. How have improved aerodynamics in bike design influenced outcomes in Hawaii? Similarly, with the advent of power measurement we can look at how much improvement the athletes themselves have made in the saddle. There is less data available and the science around it is certainly less exact, but what we do know yields more interesting tidbits of Kona performance that we’ll offer up in our next installment. If you enjoyed this analysis of Ironman statistics, check out Part 1 (overall performance) and Part 2 (swim).